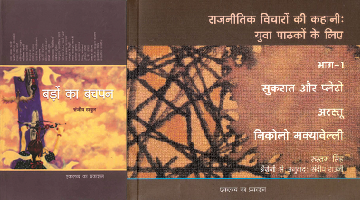 These are those books which are facts based and realistic in nature. Non Fiction is often forgotten as a good source of reading in schools and by parents. Therefore it can often be hard to find good non -fiction for teens but we have given special attention to this genre looking at its importance for teaching and learning for the young adults. This charming political comic expose details the shocking truths, based on verifiable fact, b..
बचपन वह दौर है जब हम तमाम चिंताओ से दूर खुलकर जीवन का आनंद लेते है । 'लोग क्या सोचेंगे ' इस खया..
Fun, laughter, games, fights, lies, tears, friendship…such is childhood! The carefree, fun-filled da..
Shirin Ratnagar-the famous archaeologist presents the various sources through which historians essay..
What does it mean to be an untouchable in India? Bhimrao Ramji Ambedkar (1891-1956), one of India’s ..
Based on the Bhopal Gas disaster, in December 1984, it vividly presents the story of the destructive.. Explore the intriguing world of leaves: What determines the shape, size and colour of leaves? How do..